His Highness the Aga Khan, Imam of the worldwide Shi'a Ismaili community and Chairman of the Aga Khan Development Network addressed an audience of change makers, political leaders and keen observers of the global condition on the evening of September 21st at Toronto's distinctive Telus Centre for Performance and Learning. The marquee event of the inaugural Six Degrees Citizen Space conference organized by the Institute of Canadian Citizenship brought together luminaries, artists and prominent voices from Canada and around the world to debate, discuss and reflect upon the core issues of our contemporary world: inclusion, belonging and citizenship. 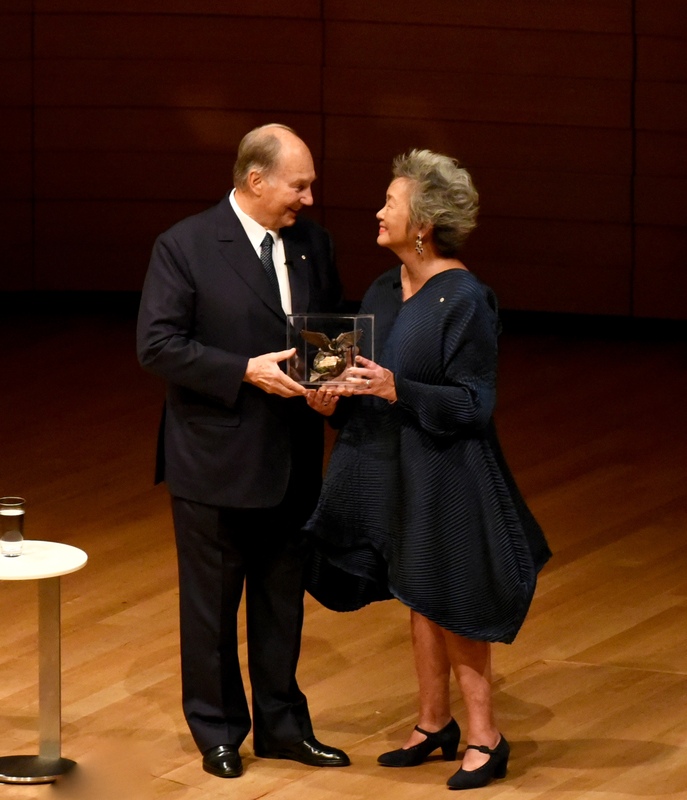 The Aga Khan was in Canada to receive the inaugural Adrienne Clarkson Prize for Global Citizenship for his life's contributions and steadfast commitment to the ideals of inclusion and belonging. The prize awarded to a true global citizen, one who transcends the narrow ties of nationalism in hopes of improving the lives of people around the world, honoured the Aga Khan's commitment to helping the world understand pluralism better as well as the ability to realize this vision through his multi-agency Aga Khan Development Network, which operates in more than thirty countries in the domains of health, education, social and economic development, culture and disaster relief. In her opening remarks, former Governor General of Canada, the Right Honourable Adrienne Clarkson, for whom the prize is named, referred to the Muslim leader as a beacon. "He has become a light in much of the world's conflicting darkness," she remarked, speaking of the Aga Khan's commitment to enhancing the quality of life of millions of people from around the world at a time when poverty and displacement from war and natural disasters are ravaging many of the world's underprivileged regions, stripping peoples and families of of their dignity, contributing to a deep sense of uncertainty about their futures and ultimately confiscating from the most marginal of communities, their right to hope and optimism. For the Aga Khan, development is not charity, but rather an enabler, a participatory process that empowers its beneficiaries, putting the destiny of families and communities in their own hands, ideally with life changing, generational consequences. At the policy level, the Aga Khan continues to create spaces for dialogue, respect and understanding in an increasingly fractious world. This is not only true in Asia and Africa, where many programmes of the Aga Khan's development network operates, but also in Western Europe and North America, where insular forces and sentiments are reversing years of progress in making these regions inclusive and welcoming. In Canada, which His Highness described as a "country of opportunity," he has invested in a number of significant institutions whose outlooks have far reaching aspirations. The Global Centre for Pluralism, a partnership with the Government of Canada located in the nation's capital, seeks to advance pluralist mindsets around the world, to understand how pluralism operates and under what conditions it fails, and to find ways to export the values of cosmopolitanism to places where it is most needed. 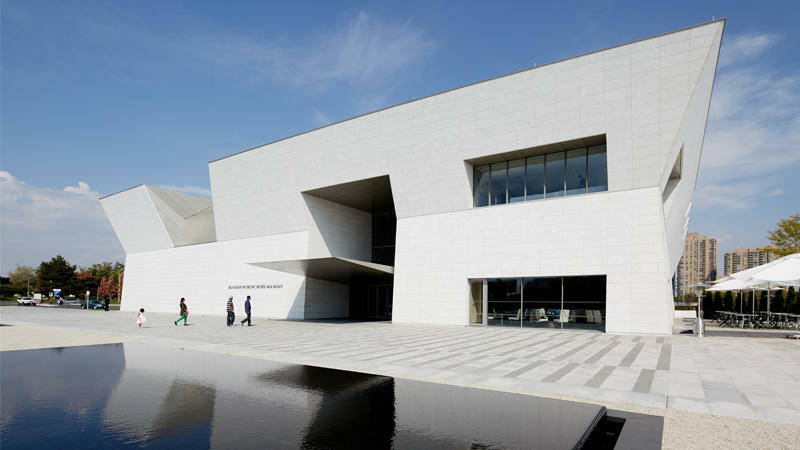 The Aga Khan Museum in Toronto, while showcasing the arts and cultures of Muslim civilizations, past and present, aims to educate Muslims and non-Muslims alike about the sheer diversity, beauty and richness of artistic production that is and has been a hallmark of the Muslim world. The Museum also attempts to highlight moments of exchange and cooperation between the Muslim world and other civilizations which have resulted in new forms of artistic production, knowledge and expression. Through initiatives such as these, the Aga Khan aims to redress the clashes of ignorance so prevalent in the world, instead bridging the divides in knowledge that have separated peoples of different cultures, languages and religions rather than bringing them together. For His Highness, pluralism is an essential value, not unlike human rights, and is the precursor to global citizenship. Approaching his sixtieth anniversary in his office as Shi'a Imam, a position he inherited from his grandfather in 1957, the Aga Khan has been witness to massive transformations in the world, not only in the spheres of technology but equally so in the political realm. More than 60 nations have appeared on the global map since that period; what were once colonies are now countries and what was once one peoples sharing a common culture and landmass have now been bifurcated into multiple territories and national identities. As these states march forward into the future, they face their own challenges. One of which has been that entire regions, cultures and populations within these countries do not have access to the basic needs of security, health and education. Nor do many aspirant families feel that things will get better. As a result, more mobile citizens are increasingly looking for opportunities outside the continents of their birth, sometimes at great risk. Coupled with the massive acceleration of human movement due to war and natural disasters, migration has become one of the most challenging issues of our time. Not everybody is open to welcoming "the other" within their midst. "The task is not merely learning to live with that diversity, but learning to live with greater diversity with each passing year." "One enormous challenge, of course," observed the Aga Khan, "is the simple fact that diversity is increasing around the world. The task is not merely learning to live with that diversity, but learning to live with greater diversity with each passing year." 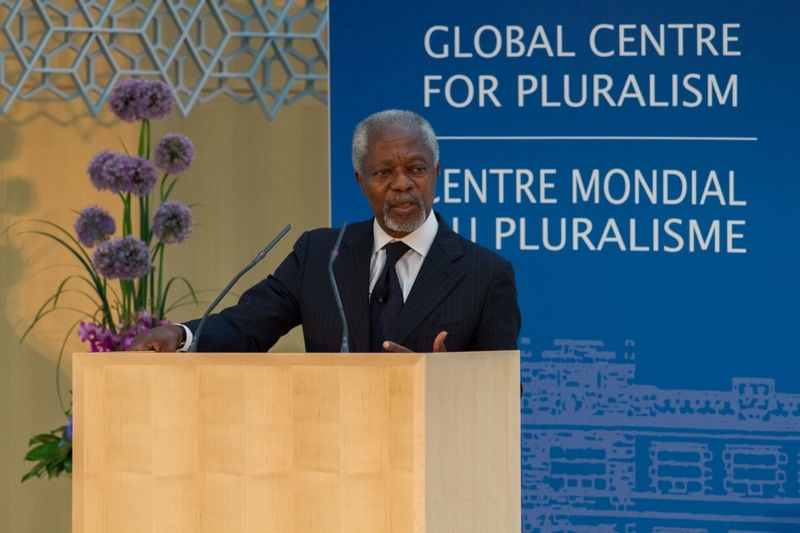 The Aga Khan fully recognizes the frustrations of the pluralism story. The challenge, he noted, was that as we become aware of the diversity of the world we live in and come into contact with people who are different than us, difference becomes a source of conflict rather than an opportunity. "We talk sincerely about the values of diversity, about living with complexity. But in too many cases more diversity seems to mean more division; greater complexity, more fragmentation, and more fragmentation can bring us closer to conflict." It is not just proximity that creates this awareness, and often tension. Technology and media, while seemingly bringing us together, recognized the Aga Khan, often pull us apart, feeding ignorance and insularity. The antidote, however, isn't ignoring difference. "We often hear in discussions of Global Citizenship that people are basically alike. Under the skin, deep in our hearts, we are all brothers and sisters - we are told - and the secret to a harmonious world is to ignore our differences and to emphasize our similarities. What worries me, however," said the Aga Khan "is when some take that message to mean that our differences are trivial, that they can be ignored, and eventually erased. And that is not good advice. In fact, it is impossible." "Pretending that our differences are trivial will not persuade most people to embrace pluralistic attitudes. In fact, it might frighten them away. People know that differences can be challenging, that disagreements are inevitable, that our fellow-humans can sometimes be disagreeable," he continued. Too often people think that embracing the values of Global Citizenship means diluting or compromising one's own bonds to country or peoples. This is not the case emphasized His Highness. Rather, "the call of pluralism should ask us to respect our differences, but not to ignore them, to integrate diversity, not to depreciate diversity. The call for cosmopolitanism is not a call to homogenization. It means affirming social solidarity, without imposing social conformity. One's identity need not be diluted in a pluralistic world, but rather fulfilled, as one bright thread in a cloth of many colours." How one goes about achieving this is no easy task. He ended the evening with a recipe-of-clarity-and-wisdom in charting a future for global citizenship: "a vital sense of balance, an abundant capacity for compromise, more than a little sense of patience, an appropriate degree of humility, a good measure of forgiveness, and, of course, a genuine welcoming of human difference." The Aga Khan's full speech can be found here.